PDF Text books, Ebooks, E-Text Books, Class wise-Subject wise-Medium wise-SCERT-Telangana-E- books-New-Text-Books: We can differentiate a literate person and illiterate person, not only by the physical appearance but also by the way they behave, speak. A person can speak very fluently, confidently by gaining knowledge. Gaining knowledge continues in a successful manner by continuous reading, discussing and by sharing from one another. Library plays very active role in reading. Every should have their personal library, but somebody failures in the arrangement of library, and also fails to keep all the books that he/she needs at some time. Carrying books is also risk factor, then how can we refer? clear out doubts?etc. So, carrying books should be easier, the best choice is that e - book, for this we only need a cellphone or system. Now - a - days we can't imagine our society with out a cellphone, any person any place holds a cellphone, in such manner cellphone are bounded among us. So, it is not a matter that to read e - book at the time you need. 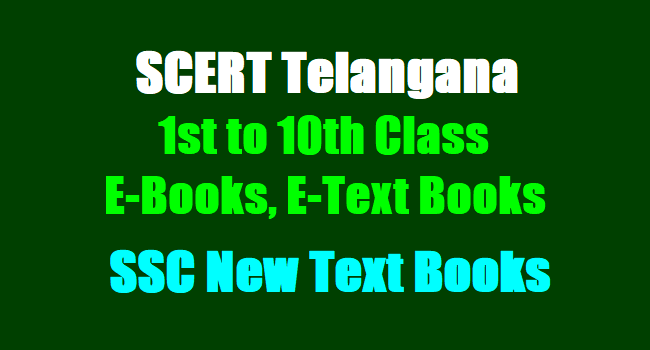 Books of class I - X (T/M,U/M,H/M) books are available students of any class can refer these books. Academic books are very useful to the D.Ed, B.Ed students for their record writing, teaching practice. Useful for the candidates who are appearing for DSC. A Teacher while explaining a topic, the basics he/she personally can have an idea and also useful to explain the students in the class room. - We can save paper usage/pollution. - No risk of preservation. - We can go through the topic with in seconds. - Parents can refer and explain their children. - Preparation for exams, writing records. The way to read these books is first visit the www.teachersbadi.in website and then you can click e - books. You can get the way to read books what ever you want in T/M,U/M,H/M in pdf utilise such wonderful opportunity. Thanx a lot for making it available on net. Very useful thing. Thank you very much..